Carl – Thank you for your research and insightful commentary. You have obviously done your homework. Bravo. Question: Are the Unceded 1851 Treaty lands on your map included in the later 1868 Treaty agreement? The verbiage I keep seeing describes 1868 as an *expansion* of the 1851 boundary. Red Cloud’s War for the 2 years prior forced the US to renegotiate. They agreed to add the Black Hills plus hunting lands in other areas. So 1851 + Black Hills = 1868. However, that language conflicts with a visual reference. The Wikipedia map of the 1868 Treaty shows that the 1851 land is not included in the later treaty agreement. Further, when Sitting Bull dissented and refused to sign, he said, “I wish all to know that I do not propose to sell any part of part of my country.” That would indicate a reduction in his area to the north, although he was likely speaking in a broader sense. The only way to clarify that northern boundary is to actually read the 1868 Treaty. So I did, and quickly realized I would need your skillset to make sense of it. Can you help us understand? If that answer is yes, they are part of 1868, that’s great because the 1980 Supreme Court admitted that the 1868 boundaries should still be in place. (As we know, they refused to give them the land, and the Sioux refused the payment. $120M which is now over $1 Billion with interest, still sitting there unclaimed! Powerful statement that this land is important to them.) They sued over the 1868 boundaries. If the answer is no, wouldn’t the signing of the 1868 Treaty preclude any claim to ownership of these lands by their own hand? Essentially, they would have themselves signed away their rights. (Which is its own debate, as they could not read the agreement, had sketchy translators, and the document is signed with an X.) In short, they seem to have a more arguable legal claim to the 1868 Treaty boundaries. Thank you for the insight and the great Sitting Bull quote. Please see my response to Brandon and the correction at the bottom of the post. Based on my reading of the Indian Claims Commission cases surrounding the 1851 and 1868 treaties, I now do not believe I should have labeled this “unceded” territory, and that it should be considered ceded under Article 2 of the 1868 treaty. I agree with your interpretation that there would be more of a legal claim to jurisdiction over these lands if this were not the case, but I can’t in good conscience claim that my initial interpretation was correct. The ICC case that decided on the boundaries of “unceded” lands reserved for hunting by the western bands of Sioux explicitly interpreted this territory as extending no farther east than the 104th meridian, just east of the Wyoming border. Thus, the area in question is best described as historic Sioux territory, ceded under duress and without the agreement of all the Sioux bands. Good work researching and correcting that. Treaties and Indian Land Law are convoluted and often make their way all the way to the SCOTUS for a century after. Carl, please look again closely at Articles 16 and 17 of the 1868 treaty. http://digital.library.okstate.edu/kappler/Vol2/treaties/sio0998.htm#mn2 In Article 16, the US agreed that the country North of the North Platte River and East of the Summits of the Big Horn Mountains were unceded Indian territory and “no white person or persons shall be permitted to settle upon or occupy any portion of the same.” I’m a lawyer, not a cartographer so I leave confirmation that the unceded land referenced in this Article includes the currently disputed land. Article 17 of the 1868 treaty provides that all prior treaties were annulled and abrogated but ONLY “so far as such treaties and agreements obligate the United States to furnish and provide money, clothing, or other articles of property to such Indians and bands of Indians as become parties to this treaty, but no further.” The plain language of this Article requires no interpretation (a legal aphorisms Scalia loved when the plain language suited him). This Article confirms that territory unceded in the 1851 treaty remained unceded. As to the ICC court decisions, I apologize for my snotty lawyer slipping out in my earlier reply. I forgot not everyone knows what I do, but there is a legal reason for my belief that reading them will be useless to a straightforward analysis of the law. Like the Constitution & federal laws, treaties are the Law of the Land in our country. They are supreme. See https://www.law.cornell.edu/constitution/articlevi. So just as the plain language of the US Constitution cannot legitimately be limited by or altered by a subsequently issued court order, neither can a treaty, including the Treaty of 1868. One last but perhaps disposivite point of law to keep in mind. While no state or federal court can violate a treaty by rewriting or “interpreting” it to conflict with its plain language, the Supreme Court has held that treaties are equal to federal laws so the last in time rules. Yes the Supremes decided that a federal law that terminates or modifies a pre-existing treaty is dishonorable and may lead to war, but that’s not the Courts problem. See https://supreme.justia.com/cases/federal/us/112/580/case.html Head Money Cases, 112 U.S. 580, 598 (1884). If, and I do not know, a federal statute has been passed since the 1868 treaty was signed which proclaims the unceded lands have by force of this new law been ceded (or some other such legislative jargon), then the Standing Rock Sioux are in legal & real word terms, screwed. On the other hand, if that were true, I have to believe we’d all have heard it by now and no one would be talking about treaties. On the third hand, I’m not an expert in this area of law, so if you or one of your readers knows of such a federal statute, I’d welcome a citation & I will read it. Best regards & my appreciation for your work on this. It has helped me improve my grasp of the issues immensely. Thank you for adding this valuable information to the discussion. I am not a lawyer; I have done some outreach to lawyers to ask about this issue, but haven’t yet gotten a good response, so I really appreciate you taking a look at this. It was pointed out to me that Article 2 of the 1868 treaty includes the language “henceforth they [the Sioux] will and do hereby relinquish all claims or right in and to any portion of the United States or Territories, except such as is embraced within the limits aforesaid, and except as hereinafter provided.” Articles 11 and 16 fall under the “as hereinafter provided” clause, but the language of Article 16 is not plain or clear in regards to what the boundaries of the unceded hunting lands are (in contrast to Articles 2 and 17). The ICC interpreted this vague language as not including the land north of the Great Sioux Reservation, stating, “We think it clear that the eastern boundary of the lands described in Article 16 could not have been intended to be the Missouri River. During the negotiations, the hunting lands were described as being between the Black Hills and the Big Horn Mountains” (23 ICC 358). I appreciate your broader point about the ICC and other courts interpreting treaties, and I certainly think some of the ICC’s interpretations were questionable and could be challenged. In this case, their decision to set the 104th meridian as the eastern boundary of unceded lands north of the reservation seems pretty arbitrary. What I did in terms of editing my map was fall back to leaving it an open question whether the territory shown should be considered “unceded” or not, which seems to be the most defensible position at this time. It’s up to lawyers like yourself to do the really important work to push for greater recognition of Sioux rights in this territory. I hope that can be one beneficial outcome of this whole debacle. In it the author addresses the apparent conflict between the 1851 and 1868 treaties, and concludes that the “unceded” label is still accurate. Thank you for the link to this helpful article. The ICC case it references appears to be 42 ICC 214 (1978), which reviews a great deal of the negotiations surrounding the 1868 treaty and states that “based on the representation of the United States negotiators, the Indians cannot have regarded the 1868 treaty as a treaty of cession.” The article makes a strong argument that, the actual language of Article 2 notwithstanding, this understanding of the 1868 treaty should be considered legal doctrine. I wonder if you’d contact the other person (PamIam (@ChiCityPam)) who commented and ask her (or him) for their thoughts on the article I cited. It could turn out to be very important. Also, if you have a continuing interest in this topic, please contact me with an email I can use to keep you updated. It’s an active topic (and likely to become even more active). Well, it was factually incorrect, nonetheless. And some people appear to have been misled. Reference appears finally to have been made to the attorneys representing Standing Rock. Did they ever give advice on the fundamental question of whose land this was? According to the Federal Courts, it was federal land. NPR continues to say it was Sioux land. The Estes/Osler article “concludes” with a Constitutional question founded on “moral” considerations and uncited legal propositions. It fairly repeats objections to actions taken in the 1940’s relating to the flooding of reservation lands. One wonders whether — given that the treaties in question all conveyed some variation of quitclaim, as opposed to title — it even makes a difference that land is “unceded”, as a matter of “legal doctrine.” Being that the watercourse in this instance is navigable, the prevailing legal doctrine would appear to entail tribal inability to constrain rights of easement BELOW the watercourse. Or so it would seem to a grizzled (JD) student of the law of nations. Many thanks for creating these maps. As a fellow cartographer, I recognize and appreciate the time and effort you’ve put in researching, locating, and digitizing the necessary data. Out of curiosity, would you be willing to share your shapefile of the disputed Sioux lands, and your process for getting the source data into ArcGIS? Did you georeference an existing map (such as this one: http://ndstudies.gov/gr8/content/unit-iii-waves-development-1861-1920/lesson-4-alliances-and-conflicts/topic-2-sitting-bulls-people/section-3-treaties-fort-laramie-1851-1868) and then digitize/trace the polygon? If possible, I’d love to use the layer in a story map. I’d happy provide full credit, of course. Thanks again! Hi Cooper–I can provide you with these shapefiles, though it will take a couple of days because I need to do some light final editing on one of the boundary datasets. I did not digitize the map you linked to or any like it that are online, as these are much too small scale to be reasonably accurate and do not adequately cite their sources. It took several weeks of hunting to come up with the sources of these boundaries, which are partly the treaties themselves and partly old Indian Claims Commission cases from the 60s and 70s that interpreted them combined with Indian Land Cession maps by Charles C Royce. I have included all of the source information in the metadata for the shapefiles. I’ll e-mail them to you once they’re fully ready. Great map and blog! I’ll definitely be checking out your WebGIS tutorial too! I’ve been trying to create a DAPL story map similar to this one and am mostly using census shapefiles right now. I was wondering where you got your data as well and if you could possibly send my some shapefiles you used. I’ve also been trying to find spatial data for the original route proposed but have only found a shapefile for the new route. Did you find a line shapefile for that or did you digitize it somehow? Did you also use any spatial data for the sacred sites bulldozed? Thanks. I will send you my data. I digitized the pipeline route and alternate route from a figure in the DAPL Environmental Assessment. I created the Sioux treaty boundaries from scratch based on a great deal of research into historic Indian Claims Commission cases and digitization of 19th-Century maps; this is the only digital dataset of these boundaries I am aware of. The box indicating where sacred archaeological sites were bulldozed bounds the area surveyed by Tim Mentz Sr. where he identified those sites in a court affidavit. As the individual site data is sensitive, I generalized it to a bounding area per the request of Standing Rock tribal staff. Thanks! I don’t really have time to work on it, but there has been a lot of demand for maps of other pipelines in North Dakota, so it would be great if you can do this. I was thinking it would be neat to use line weights to visualize pipeline volume and maybe color to show liquid type–just a thought though. Happy mapping! Would that not also include the 1851 treaty land? At lest all land using the Missouri river as an eastern border. No. The 1851 treaty land is all west of the Missouri River. The river would form the western border of lands on its east bank. This clause refers to two reservations on the east side of the river that had already been created for eastern branches of the Sioux when the 1868 treaty was signed. Thanks for the excellent, detailed map, and fr the detailed commentary from all. Thank you! Feel free to share if you want, I have a lot of work in it. 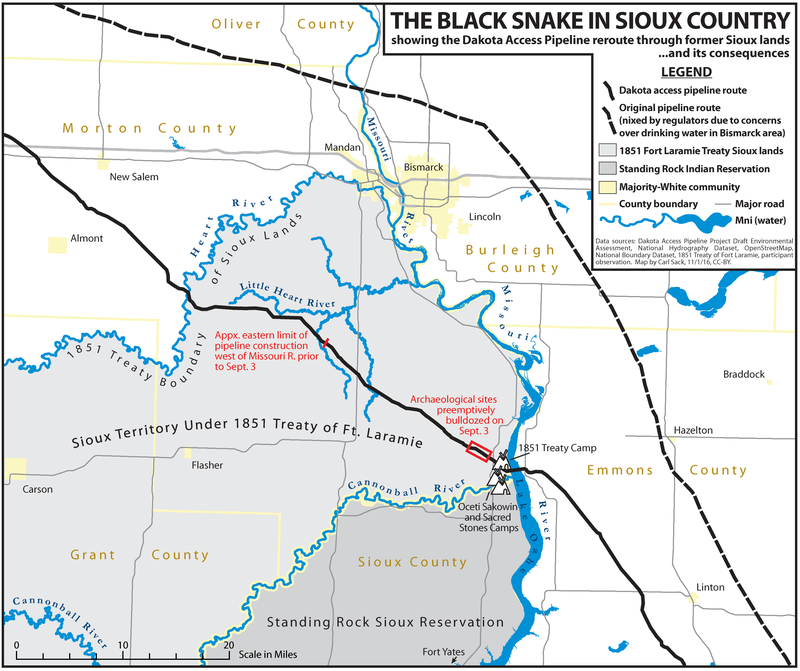 Wouldn’t the DAPL cross under the Missouri above the dam? How, if so, would it threaten the entire system down to the Gulf? Doesn’t your map need some footnotes in this regard? Not sure what you mean. Would the dam stop the oil if there’s a spill? One would have to presume that any spill would be contained within the impoundment. At 29 cubic kilometers in volume, what size of spill (catastrophic) would have to occur to be uncontainable? The dam itself would have to be breached for the spill to spread to areas below Pierre, the capital of South Dakota? Moreover, the impoundment itself, as far up as the DAPL, would presumably be slack water. How, exactly, and to what degree, would the water in the impoundment be contaminated? In any event, these questions might best be addressed in the course of claiming that the entire waterway, down to the Gulf of Mexico, would be compromised. One presumes that the drinking water in the impoundment would not be contaminated above the spill and therefore, that standby relief drains could be constructed above the pipeline. I refer to comment above relating to discussions posted 22 January 2017, as a reply to my 7 December 2017 postings, as there did not appear to be reply options to the more recent items. I’m currently an Undergrad working on a DAPL project for an Applied GIS course at SUNY Geneseo. I have been trying to figure out how to contact you to ask you about your map, specifically the DAPL routes and where you were able to find them? they are essential to making my project viable ! Hi Yanitza–I digitized the pipeline data from a figure in the Environmental Assessments submitted by Dakota Access to the Army Corps of Engineers. I will send you the data. You can also find the full pipeline route at https://bakkenpipelinemap.com/ (click “About” for the link to the GitHub repository that has the data). This is wonderful, thank you so much. I have posted the map and the link to this page on facebook.